So, this is your first time at the World Boardgaming Championships. A bold prediction: it won’t be your last. My first Avaloncon (that’s what the WBC had been named in a prior life) was in 1997, so I’m hardly a veteran, but after several years I can share some advice. Prior to that first gaming con, I was unsure what to expect. Would there be rooms of intense competitors vying for first place in cut throat fashion? Would there only be expert players who would scoff at my feeble gaming strategies? After all, participants come from all over the US, and some even travel from overseas. Would everyone be playing to win rather than playing for fun? Well, I was pleasantly surprised to find a great mix of players. Most were at the con simply because they were boardgame enthusiasts. They loved the same games I did! A few were beginners who were trying a different game for the first time. Most were experienced players who knew the intricacies of the game and were fun opponents. Oh, there was plenty of great competition, but unfriendly, cut throat, win-at-any-cost types were very few. I learned the emphasis is put on sportsmanship, and the biggest prize (a free room next year) is given to the person voted best sportsman. I had a blast and return whenever possible. And every year I’m surprised by the size of the crowd. It’s not that there isn’t enough room in the con hotel, it’s just that every ballroom and meeting room is put to good use. There are a small but growing number of families that make the pilgrimage an annual vacation. Otherwise, over 80% of the attendees are male from age 20 to 60. Sorry, guys, this is not the place to meet lots of single women, but I suspect you already knew that. The official schedule has events (that’s WBC-speak for “game tournaments") running daily from 9 a.m. to around midnight, but you can find someone awake and ready to play in the open gaming areas at any hour. 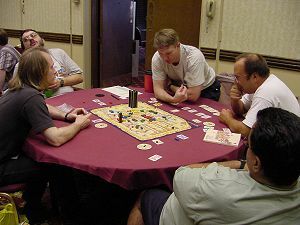 Attendees, especially those from outside the region, are dedicated boardgamers: travel cost plus staying almost a week at the hotel is not cheap. You can reduce the cost by sharing rooms and/or auto travel. Doubling up in a room halves the cost. Tripling or quadrupling reduces it still further and is not uncommon. Pack as you would for any trip of this duration, and bring a swimsuit for the pool. (There are two.) Typical Lancaster weather from June through August is hazy, hot, and humid, so shorts and light shirts work well outdoors—though you may not get out much. I quickly learned not to leave any heat sensitive items inside my car. One sunny day, I made the mistake of leaving my copy of Eurorails there, and the special wax crayons turned into a gooey mess. The “weather” inside the hotel can be a bit tricky. A sweatshirt for the ballrooms or late at night often comes in handy. Weather forecast. Be sure to bring copies of games. After making the trip, you don’t want to miss playing your favorite game just because there aren’t enough copies of it. In fact, if there are insufficient sets to go around, the GM (that’s “GameMaster", the person in charge of the tournament for that particular game) is authorized to give you preferential standing (for example, an easier matchup or perhaps a bye) if you have your copy. Also bring some of your favorites that no one back home will play. Out of the 1,000 or more attendees, you’ll almost certainly be able to find a few people to try it in the open gaming areas. Despite your urge to game non-stop, eventually you’ll get hungry. The hotel offers good food at reasonable prices. There are daily specials at Chef's Marketplace from 9 a.m. to 9 p.m. In addition, you'll find lunch and dinner specials daily. (They are listed in the program.) There are also great restaurantes in the area—check with your fellow gamers or the concierge desk for recommendations. During the WBC, I seem to operate on adrenaline. Doing so non-stop is probably not the best thing for your body, so try to make time for sleep. Sleep never comes easy for me because my mind is still replaying all the glorious moments of the day, as well as rethinking the failed decisions. Wish I knew a good way to unwind. Maybe my last game of the day should be something I find boring? Or, maybe a dip in the jacuzzi (if still open at that hour). Anyhow, try to plan for this so you aren’t completely exhausted by Sunday. Remember: it’s a marathon, not a sprint. If you are a first-time GM, memorize when and where (what rooms) all your heats/rounds are. You’ll be asked approximately every five minutes for that info. 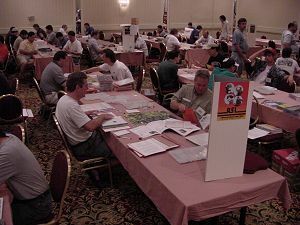 Try to arrive about 20 minutes before the start of the round in order to begin signing in players and getting the table matchups organized. Haul your kiosk from the storage/display area in Paradise Terrace to the appropriate location. Have a plan in mind to handle late arrivals. You can be sure someone will show up 15 minutes after everyone else has started and will desperately want to play. A reasonable way to address this is to start another table provided there are enough opponents. Brush up on the rules because something you’ve never seen before can and will happen. Don’t be afraid to consult the rulebook (and your assistant GMs) while making a decision: it shows you care about getting the situation right. Finally, make note of any interesting happenings so you can write about them in your event report. Also, take advantage of the GM:101 Seminars offered on Tuesday! The bottom line is to have fun. 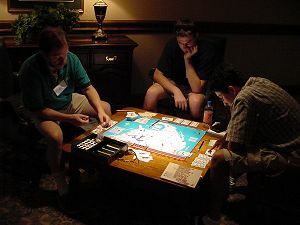 It’s not easy to find such enthusiastic boardgaming opponents elsewhere, so make the most of it. Tip: save up your best dice rolls and bring them to the con. But, seriously, even if you don’t “take home the wood” (that’s WBC-speak for winning it all), you’ll take home plenty of fun memories. And, I predict you’ll be back again next year. Last updated 7/21/06 by kae.